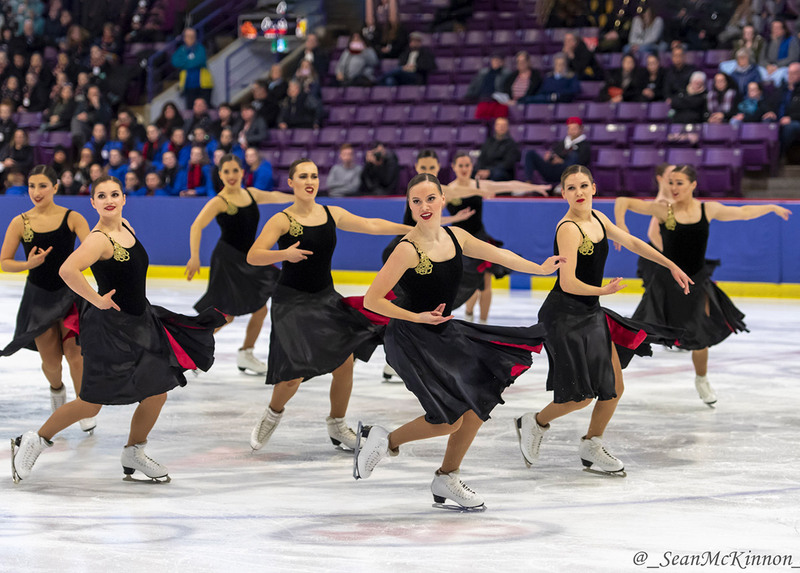 It was a packed crowd and rowdy reception which greeted the Senior and Junior short programmes on Friday and dominating the competition with a huge 83.56 was Nexxice, Canada. They delivered a stunning performance to Carmen with strong Flamenco inflections throughout and flawless interpretation of the music. Their understated dresses with just a flash of red matched the character of the dance perfectly. In second place was Crystallettes (USA) who danced the Moonlight Sonata in a dramatic and powerful performance. They suffered a fall in the twizzles but scored 67.36 points. In third place from Nottingham, GB were Icicles Senior. Fresh from earning the British Championship title, they had a sassy performance to ‘Play that Sax’ but made mistakes in their intersection and twizzles elements which cost them points. In 4th place with 30.63 was Zariba from Aberdeen, GB. They skated to Miley Cyrus FU but were downgraded on several elements. In 5th place was Wight Jewels from Isle of Wight, GB who skated to Adele. They scored 28.82 points, dropping 5 points from the score they earned at Nationals. 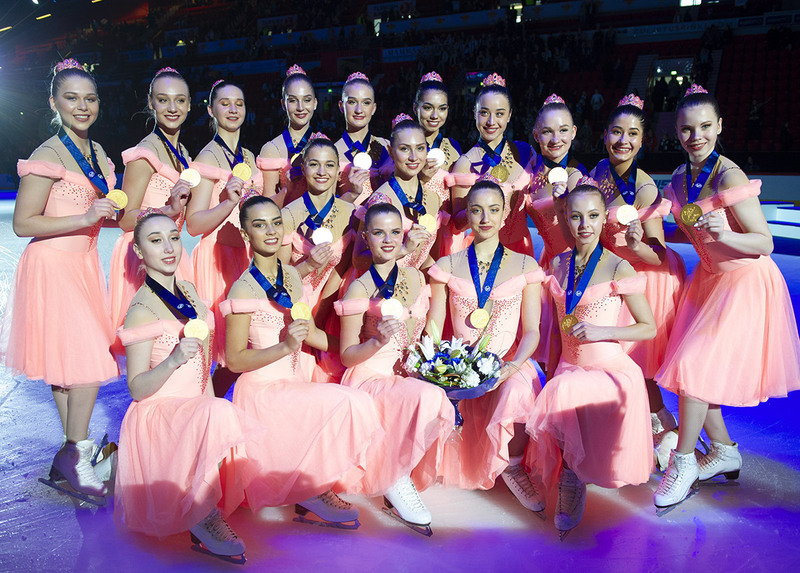 In 6th place was Ice United, Netherlands. They had a lively, boppy programme but suffered from two bad falls just before the pivot block which they didn’t recover from. Team Magenta Senior, Cardiff, GB withdrew before the short programme. In the Junior Category, there were two teams competing. Team Berlin Junior from Germany won the short programme with 47.25 points. Wearing vibrant pink geometric shapes on their grey dresses, the programme was interesting to watch however they were downgraded on their Moves Element. In second place was Icicles Junior from Nottingham GB. 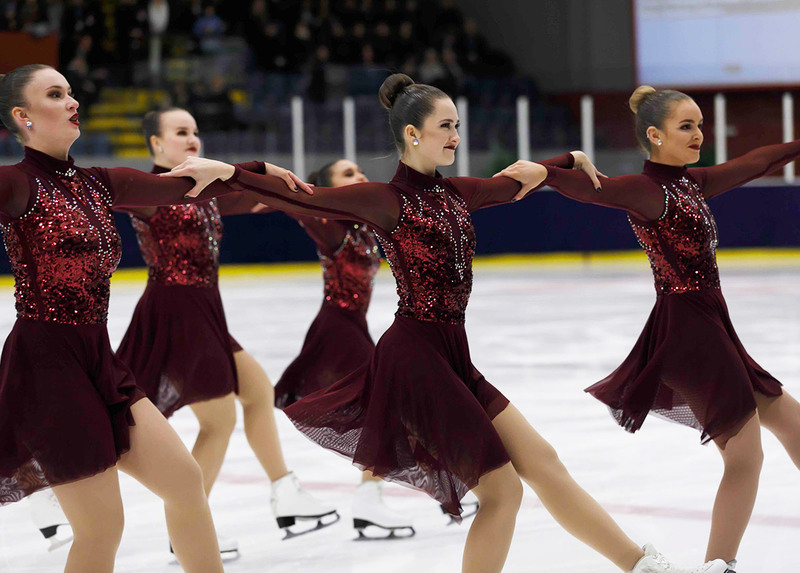 With their Disney inspired programme, complete with the appropriate paraphernalia incorporated into their dresses, they skated a strong programme, earning 40.15 points. The competition continues on Saturday in Scotland. Do not miss the final results soon on Jura Synchro!